Finely dice the shallot for the dressing and the salad and divide into their respective quanities (1/2 shallot for dressing, whole shallot for salad). Prepare the vinegrette first by whisking all the dressing ingredients togther until oil is emulsified. Season with salt and pepper to taste if desired. Set aside. Wash and dry the mixed greens and put them in a wide pasta bowl or individual bowls. In a heavy bottomed skillet heat olive oil on medium heat. Add the minced shallot to the skillet and cook 2 minutes then add the mushrooms and pine nuts. Stir to keep evenly coated (adding a little more olive oil if needed) until mushrooms are tender, about 5 minutes. Turn off the heat and season with salt and pepper to taste if desired. 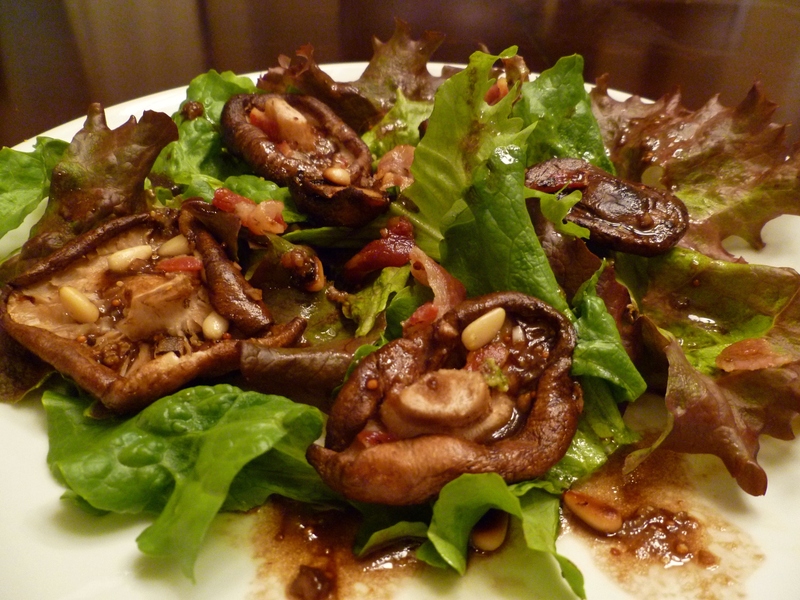 Divide the mushroom mixture over the mixed greens then add 1/4-1/3 cup of the Garlic Vinegrette evenly over the salad. Serve immediately.